As I sit down to share with you our week, the sun is already high and there is a cool breeze coming through the open door behind me, causing the drapes to brush up against the back of the chair… this chair… the one in the photo. Usually I avoid laptopping in the living room but this morning I’m making an exception. I’ve spent a lot of time this week in the office upstairs and need a change. Well… a blender is revving in the kitchen as Liz is making 6-week muffins: a recipe of my mom’s where the batter can stay in the fridge for up to six weeks (it never makes it that long) and you make up a pan as the fancy strikes. Sophie is helping her and the boys are slowly coming to life upstairs. There will undoubtedly be some YouTube videos and or Minecraft in their near future, although Dominic has also recently finished an audio-book… oops, I’m mistaken, he just came down to the dining room table to review math. While the kids have finished their classes (the two older kids prior AYC and Timo this week) there are still tests to be written and research projects to be completed, so there has been a bit of extra “pushing, pulling and tutoring” this week. Liz carries the bulk of it but I’ve stepped in a few times to avoid disaster or breakdown! 🙂 The fact that temperatures have been in the mid to upper 30’s (high 90’s) hasn’t made things easier. Liz & Soph had a mother-daughter date night last night at Pât-a-pain. The “pain” of still having school work to do is taking its toll, even on our most disciplined student and Liz wanted to ensure that their relationship had other aspects than just school & church. Balance is good, so a “girls’ night out” was in order. By the time Friday rolled around, I was ready for some people time. Andy is one of two Bible School students from the Châtellerault church. He lives in Tours (45min away) and is a business student at the university there. Between his year-end exam schedule, his work schedule and us being away for AYC, we had not gotten much “face time” of late… so we got to spend a little time together. Do you help promote missions in your local church? 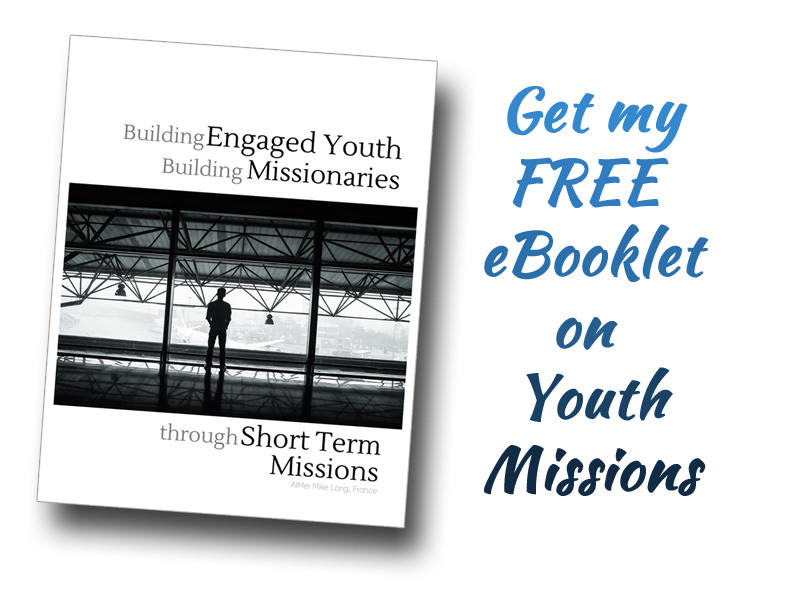 Do you teach kids about missions in Sunday School? Does your youth group actively pray for or support missionaries? Are you a “Missions Prayer Pillar” in your personal time? If so… please download our latest Partner in Missions Newsletter. It will give an overview of our time with the General Youth Division’s Apostolic Youth Corps trip to France. Your support allowed us to facilitate short-term missions experiences for 37 young people and their chaperones from all over North America; contributing to the future of Global Missions. In the wake of the much excitement that was AYC, this was very much a catch-up week… a bit more of a normal week if I can put it like that. Administrative hurdles related to our building: These must be worked through before we’re able to do any wide-spread evangelism efforts. My residency application: They’ve asked for more paperwork. Pray that there be no major hurdles. Thank you for your prayers and your support. It allows us to fill the gap during Bro. & Sis. Brochu’s absence… ensuring that the work continues. God bless your day today & let what you read inform your prayers for France! Like so many other areas of your lives we can count on your faithfulness in writing your blog. Every Saturdsy morning, it seems, your blog is waiting for me when I finish devotions. Prayed for your various requests this morning. You all are doing an awesome job! I’m glad Miranda has been approved for AIM. Thanks Bro Poitras… Appreciate your faithful readership, friendship & support! Yes, she’ll be here in less than a month for a short visit.